As the year comes to a close, many people are resolving to do things differently in the next one. Some people hope to change their diet, others hope to spend more time with their families, but what it seems almost everyone has in common is they are hoping to save some money. Saving even just a little bit of money can make it easier to achieve your dreams and achieve the sort of financial security you have been looking for. However, it is one thing to simply resolve to save money, it’s another thing to actually start doing it. The holiday season is a time of the year in which many families are tempted to overspend and purchase things they simply do not need. Becoming a disciplined saver is something that will require hard work and deliberate effort. Though it may not always be easy, saving is certainly worthwhile. Whether you plan to pay off your credit card, take a trip away, save for a new home or invest in your future, everybody could do with a little extra cash. But as we all know money certainly doesn’t grow on trees. And as we struggle with our bills and expenses throughout the year savings can slip away as an afterthought, while credit card debts and repayments can slowly creep up on us. To get yourself started, break down your bigger financial targets into smaller, more achievable goals so that you know exactly what you want to achieve financially from the year. And if you really want to make these goals stick be sure to write them down, since there’s nothing more helpful than having a visual reminder to keep you on track. So put pen to paper, or finger to a smartphone, and get started on your list of goals. The next step towards a successful year financially is to set yourself a tight, well-rounded budget that will help you to achieve these goals. This will assist you in monitoring your spendings and savings throughout the year, helping you to eliminate any unnecessary purchases of luxury items that may tempt you when your wallet is particularly plump. A great way to encourage regular savings is to open a high-interest savings account, where you can easily deposit money but will have more difficulty withdrawing it. To make sure you’re making regular savings deposits, consider setting up a recurring transfer into your savings account to be made just after you get paid. Just be sure that you’re staying on budget and don’t end up overdrawing! If you can manage to put away $100 per fortnight, then by this time next year you’ll have $2,700, plus the interest that money generates, to put towards the savings target that you set yourself now. Talk to our expert team to properly plan out your budget and savings plan. We’ve helped hundreds of families before and we can help you. Saving money doesn’t have to be just about keeping to a tight budget, a great way to save money is by reviewing your insurance and your home loan. Take this opportunity to check your mortgage and insurance policies against the competition to see if you can find a better deal. A little bit of extra work now can mean huge savings in the long run. When it comes to reviewing your home loan, consider the different rates, fees and features of your current policy versus the competition. If you find a better deal, speak to your lender and see if they can match or beat it, and if they can’t, don’t be afraid to switch lenders! Review all of your different insurance policies, including both your car and home and contents insurances, taking the time to compare the price and features of your policies against those offered by other providers. Just like with your home loan, if you find a better deal, don’t be scared to make the switch to a different insurance provider. What you choose to do with the money you save this year is of course up to you, however, there is no investment safer than paying off your debts. Debt can constantly linger above us, burdening our day to day lives and weighing us down financially. Constant repayment costs can make a debt free lifestyle feel miles away and completely out of our reach. So in 2017, why not make debt repayment your financial priority! While you may not be able to fully pay off your debt this year, breaking it down into small, achievable sums and making extra repayments wherever possible can get you well on the way. Consider setting repayments into your budget and don’t be afraid to reach out to one of our financial advisors if you need help. While for many people, managing a credit card debt has simply become a part of life, paying off these debts beyond the basic monthly requirements can save you years of diminishing wealth through interest payments. Your monthly credit card statements will show you how long it will take you to pay off your credit card if you are to meet the minimum requirements. However, the more you pay off on your card each month, the more you will save on interest rates. In this scenario, there is $5,000 owing and the interest rate is 18.00%. 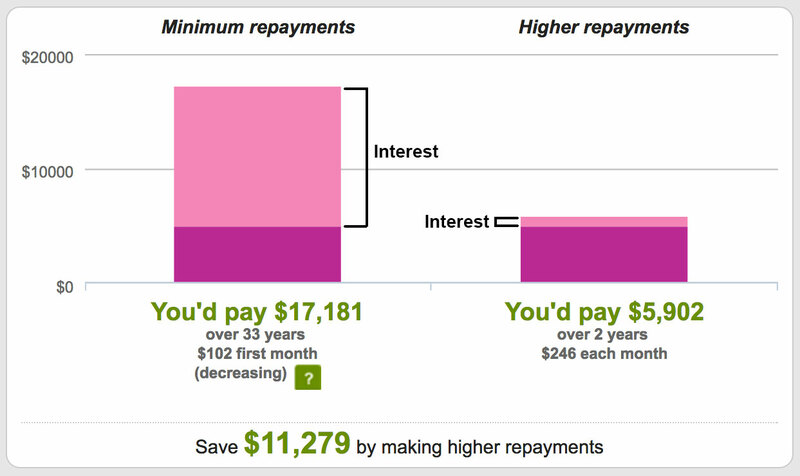 Save $11,279 by making higher repayments. Taken from ASIC’s MoneySmart. For more detail on the assumptions of this scenario please visit their website. We understand that this might just be a dream for some but there are strategies we can put it in place to help this become a reality for you. Something that many Australians struggle with is juggling several debts on a number of different credit cards, finding themselves overwhelmed trying to pay off multiple cards simultaneously. When it comes to this, ensure that you are paying at least the minimum on all of your cards in order to avoid default and late fees. You should then pay off the card with the highest interest rate first in order to maximise your monthly savings. Once you’ve paid off the first card, start to work on your credit card with the next highest interest rate, and continue the process until you’ve paid off all of your cards. Alternatively, you may prefer to pay off the card with the smallest debt first, working methodically until you have cleared your debt. Once you have paid off a credit card, you should contact your provider in order to close that card down, as you can otherwise be charged fees and service rates by your provider for a card that you aren’t even using. Another option to make your debt more manageable is a credit card balance transfer. This will allow you to transfer a set amount of debt to a credit card with a lower interest rate for a set period of time. In order to maximise the benefit of a credit card balance transfer you should ensure that you pay off the entirety of this amount before the period ends. Be sure to check the interest rate that will apply to the remaining balance if you fail to pay off the amount you set within the given time frame. Also, check what interest rates will apply to new purchases that you make using your card during this time as it will often be much higher than the rate of your balance transfer. In the end, regardless of the method you choose to pay off your credit card debt, you should endeavour to have only one credit card that you use only in emergency situations. You might also like to consider lowering your credit limit on this card to something more manageable that you can pay back within a few months. Remember that more cards can mean more debt which can create more stress. Failing to pay off your debts can damage your credit history and make future credit card and other financial applications much more difficult. BUT HOW DO I GET TO FINANCIAL FREEDOM? In the end, the best way for you to spend your money will depend on your own unique situation and you should do what’s right for you. However, taking the time to review, monitor and better manage your money this year will almost certainly provide you with benefits in the long run. Seeking help from a financial advisor is a recommended first step. Professional help is a way to ensure all bases are covered when planning your financial future. My Wealth Solutions offer over a decade of experience making million dollar futures for everyday families. We’re offering an obligation free Wealth Review for all those wanting to develop and implement a plan to get their finances sorted for 2017! Don’t wait until it’s too late to take the first step to financial freedom! Find creative ways to cut down on expenses. If you are hoping to increase your net income for the following year, you essentially have two options. You can either increase the amount of money you earn or decrease the amount of money that you spend. Generally, decreasing your expenses is much easier than increasing your earnings. Because of this, if you are looking to improve your budget, you are probably going to need to make some immediate changes. Start by actively recording all of your expenses. In the age of automatic and plastic transactions, many people find it quite easy to ignore how much they are actually spending. But while ignoring your balance may seem deceptively convenient, doing so can cause you to dramatically overspend. The simple act of writing out your expenses can help you immediately become more frugal with your money. Look for discounts wherever possible. Being an efficient saver means finding ways to pay less for the same goods and services that are being utilised by everybody else. Buying in bulk, buying things that are on sale, and buying things that are used are all great ways to save on common consumer goods. Taking advantage of credit card specials–such as those offering 0% interest for the first year or reduced interest for students– can help you avoid paying more interest over time. Additionally, automatic discount apps such as Honey make it easier to save without having to do any extra labour. Decide what is actually necessary. Most families in Australia end up spending money on things they simply do not need. By cleverly cutting out wasteful spending, your monthly deficit can immediately decrease. Avoiding unnecessary expenses doesn’t just mean going out to dinner less often or purchasing fewer luxury items. It can also involve avoiding fees, charges, and interest rates that are associated with some of the most common financial assets on the market. Owning a redundant number of credit cards, paying avoidable ATM fees, and owning an undesirable mortgage are just a few of the common ways many individuals end up paying more than is necessary. If you are hoping to avoid these redundancies, then you are going to want to take matters into your own hands. Switch to a credit card that does not charge you fees while travelling. If you are someone who travels a lot, then you are going to want to find a credit card that is compatible with your lifestyle. Frequent ATM fees are an unnecessary expense that can accumulate quite quickly. Think about restructuring your mortgage. For many families in Australia, their mortgage payment is their largest monthly expense. Restructuring your mortgage can help you bring down your monthly rate—however, it is important to note, doing so can often increase the total amount that you pay over time. Use the leverage you have as a consumer. Many individuals end up with high-interest credit cards and low-interest bank accounts simply because once they are committed to a given institution, they can no longer be bothered to change. But by shopping around and carefully examining other options, you may be able to find a way to pay less or earn more. These are just a few ways you can give your monthly budget a creative revitalisation that will make things easier in the new year. There are a lot of incredible savings opportunities out there that can be easily accessed by almost anybody—you just need to know where to look. Consider switching to a more lucrative savings account. Naturally, one of the most common places people go to store their money is a bank. Banks are particularly popular financial institutions because they are easy to access and all Authorised Deposit-taking Institutions (ADIs) are insured by the Australian Government for accounts up to $250,000. But while the roles each of these banks play may seem to be relatively similar to one another, the differences between them can be rather significant. When comparing and contrasting various ADIs, there are a lot of different factors you are going to want to consider. What are the interest rates that are currently being offered? If a certain bank is able to offer a higher rate of return than the one you are currently using, then you may want to consider making a switch. Does my bank have any sort of minimal requirements? What are the different fees that are associated with my bank? Holdings requirements, transfer fees, and convenience fees are just a few of the common ways banks will try to get you to pay more over time. Before you switch to a new account, you are going to want to look at these details closely. Which bank offers the best mixture of risk and reward? Though your deposits are indeed insured by the government, that doesn’t mean they aren’t without risk. Fees, logistics, and access to credit are all different types of “risks” that are associated with a given bank. Monthly interest rates, customer benefits, and access to financial services are all different kinds of rewards that can be associated with a savings accounts. Due to various regulatory and reporting standards that have been established by the government, each of these risks and rewards should be fully disclosed upon inquiry. Bankwest Hero Saver, HSBC Serious Saver, and ANZ Progress Saver are a few of the most lucrative savings accounts available to most Australians. Some of these accounts are able to offer up to 3% interest per year, though in many cases, earning more interest may involve certain stipulations. Though your annual salary is something that may still remain beyond your ability to change, finding better ways to save what you earn can help you functionally “take home” more each year. If you are willing to do your research and compare all of the different options you currently have available, 2018 could be exactly the kind of year that you need. Another way you can potentially save money in 2018 is by consolidating your credit card debt to the greatest extent that you possibly can. If you are an individual who currently has multiple credit cards or owes debt to multiple lending institutions, you may be surprised by just how beneficial consolidation can be. If you have debts that are owed to multiple different sources, it may be in your best interest to transfer these debts to a single source. If you owe $1,000 to Lender A (accumulating at 5% per year) and you owe $1,000 to Lender B (accumulating at 10% per year), you will be much better off transferring all of your debt to Lender A. The lower interest rate that is offered by Lender A means that your debt is growing at a lower rate over time — in this example by consolidating your debt, you will functionally save $50. Though not all financial situations are always this simple, the principles demonstrated by this example still remain true. In fact, the more debt you currently owe, the more you could potentially benefit by taking action in pursuit of consolidation. Another possible option you would have in this scenario would be to consolidate all of your debt to a 12-month interest-free credit card. Virgin Australia and National Australia Bank are just two of the major lending institutions that are currently offering credit cards with 0% interest in the first year. Based on the example above, consolidating debt into an interest-free credit card could potentially save the debtholder $150 over the course of the next 12 months. There are still a lot of great ways to save without having to make drastic changes to your current lifestyle. Though the most obvious ways to save money would involve simply buying fewer things, there are still many ways to save that do not require any sort of material change. By being conscious of the options you have as a saver, you can continually be earning more money and avoiding unnecessary fees. Naturally, each of these potential strategies above are not without risk. If you are going to make any major financial changes in the year 2018, you are going to want to consider your options carefully. Improving your financial situation is not out of reach. But financial security isn’t something that is going to be realised on its own. In order to make 2018 the kind of year you need it to be, you are going to have to be proactive, disciplined, and willing to act.